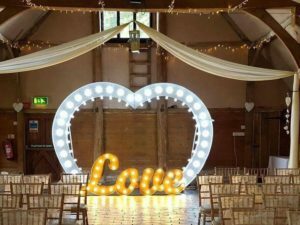 This is an absolute beast of an effect for your Wedding measuring an impressive 8ft Tall x 12ft Wide. 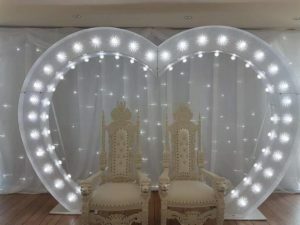 This Giant Light Up Heart is a work of art that is visually stunning. It works great with the White Star Lit Dance Floors & the Star Lit Backdrops. The pictures I see photographers getting from this effect are awesome & gives guests that wow moment when they walk into the room. This is a 3 man job to erect the Giant Heart as it is made from metal, takes up a full van to transport & also takes up a lot of storage. The plus side of this is not a lot of Wedding Suppliers have these for them reasons making it a unique piece for your Wedding Breakfast & Reception. But after all the sweat we put into it when we see it up & how nice it can add to a room it all becomes worth the toil. Previous couples use the heart for the entrance into the function room. As they enter the room for the wedding breakfast/reception they are framed by the heart & get some stunning images. 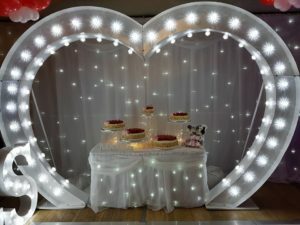 It is also often used behind the top table, background wall for our Magic Mirror photo booth or even behind the cake table just to name a few. The heart boasts 60 Cool White LEDs that create a stunning ray effect on the metal surround. As you can see in the pictures it has two support struts at the back for safety & we add weights on the feet at the rear to make it even safer to use.